Duracell vs Energizer was one of the headlining tech fights of the '80s, as Walkmanseseses chewed through cell after cell. Today, a better match up is the one between their rechargeable batteries. The Energizer AA batteries are rated at 2200 mAh and the Duracells at 2000 mAh (that's milliampere-hours, a measurement of energy charge). But the Duracells last a lot longer. I tested using an ICON LED flashlight, this solid aluminum model with high and low settings—the high setting killing a standard battery in about 3 hours. 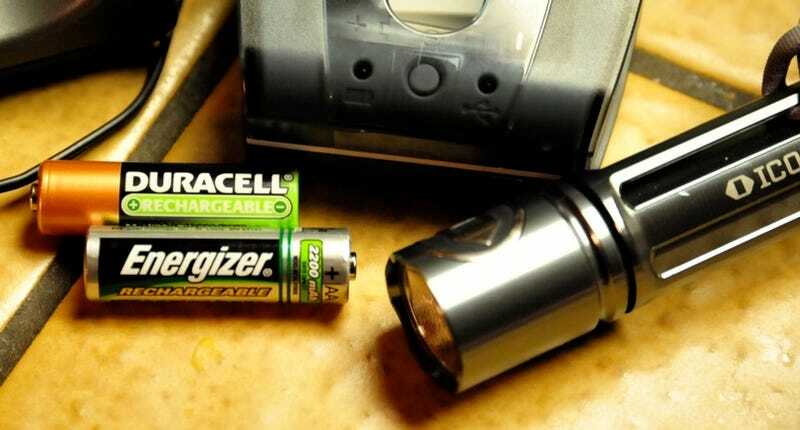 Through several trials using different cells, the Energizer lasted 2 to 3.5 hours, while the Duracells took anywhere from 5 to 6.5 hours to drain. Not an insignificant discrepancy, and contrary to the respective charge ratings on each. The Duracell family of rechargeable batteries also come precharged out of the package, so that's very convenient. They've also got USB ports for charging USB gadgets. Both companies offer car and 15 minute chargers. The Duracell Mobile charger is my favorite simply because it has a car adapter and a wall adapter, and can charge 4 AA batteries or any USB device from those sources. (It does not do 15 minute charges, however, but I'd rather buy extras and have them ready to go.) The only real drawback is that it can't charge D cells and 9V batteries like the giant sized Energizer family charger can. Both kinds of batteries are NiMH. Duracell claims their batteries will hold their charge for a year in storage, while Energizer claims only 6 months. Frills aside, the bottom line here is battery life, and Duracell has a lot more of it than Energizer.